In caring for the most vulnerable, providing access to food and basic nutrition is at the forefront of our work. In developing countries, one out of six children is underweight and under nourished, contributing to 2.6 million deaths of children under five each year. In order to have an opportunity to thrive, children must have adequate nutrition, which is why MSC makes this a priority in all communities we serve. Nutrition and feeding programs are a key part of our work in every Mustard Seed Communities location. Proper nutrition is of paramount importance in caring for children with disabilities. With the right diet and medical care, our residents can make dramatic strides in their health and quality of life. MSC routinely enlists the advice of nutritionists to ensure that residents are provided with meals that will best suit their individual needs. With our focus on sustainable agriculture we are able to grow much of this wholesome food ourselves. In Jamaica and Zimbabwe, nutrition is a key component of the Little Angels preschools where children are educated and given two meals daily. 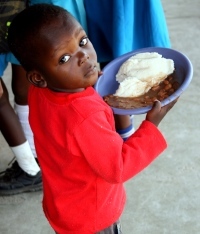 In Zimbabwe, there are four nutrition programs throughout the city of Bulawayo providing a daily meal to over 500 children. The children all travel on foot and walk up to 11 kilometers each day to receive a meal. In Nicaragua and Dominican Republic, nutrition is fundamental to the Christ in the Garbage Ministries programs. To combat a severe lack of access to nutrition, MSC distributes food packages regularly in both locations. In addition, the CIGM school in Dominican Republic also serves a daily meal to the students that attend.